MEANWHILE, I was shifted once more. From Donegal we were transferred to Drumboe Castle, a medieval stronghold in east Donegal. We stayed in this draughty old mansion overnight, and the following day, under a heavy military guard, were put into armored cars en route for Ebrington Military Barracks in Derry city. Depositions were taken in Derry, and again I was accused of varying degrees of mayhem, all of which I denied indignantly. We were photographed for further reference, just as we were, dusty and travel-stained. Then we were assigned clean cells in the prison block and given a substantial feed. After that I demanded medical attention. I was anxious to reconnoitre the hospital, for from the moment of capture I had been determined to escape. The prison yard, I discovered, contained a long, steel shed in which were interned some thirty Republican prisoners. Carefully I weighed up the advantages and disadvantages of attempting escape from this structure on the occasion when we were allowed in the yard. After a couple of days in cells, I requested the sergeant of the guard to transfer me to the steel shed, so that I could enjoy the companionship of my fellow-prisoners. Solitary confinement, I said, was rather depressing. He agreed to place my request before the commanding officer, for which I thanked him. I was wounded, and my behavior being that of a model prisoner, the request was granted; which for me meant a step nearer my escape. Luckily, they knew nothing of my connection with the Carty affair at Derry Jail! My first night in the shed I lay on the thin mattress on the concrete floor, happy as a sandboy, plotting and planning the quickest means of rejoining my comrades in the hills. That I might be shot in my attempt never bothered me; better be shot like that than by a British firing squad: for I knew there was enough circumstantial evidence against me to merit the death sentence. Ebrington Barracks is an immense institution consisting of a prison, long rows of barracks, magazines, hospital, and stables. On one side stretched the parade-grounds, where the military drilled for our benefit. Artillery manoeuvres took place on another expansive green— it seemed as huge as a prairie the night I crawled across it on my belly. The huge steel shed in which we were interned adjoined the stone prison. It was surrounded by an eighteen-foot wall, made most forbidding by projecting spikes and many layers of barbed wire. One side of the shed was formed by the stone wall of the prison, and the other three were steel plates, bolted to 6-inch by 6-inch wooden uprights set in concrete. Studying the construction, I saw that by cutting the upright next to the wall, close to the floor and about four feet higher up, I might be able to spring the plate far enough from the bottom to permit the passage of my body. As our shed was a minor jail, inside a prison with three intervening walls, we were permitted a certain amount of freedom. One favor we were granted was quite pleasurable. We were allowed brief visits from friends, and it was in this way that I managed, through a visitor to another prisoner, to send word to a very dear girl friend in Derry. I gave her full instructions as to what paraphernalia I should require for my escape, and she returned two days later, her part of the program brilliantly fulfilled. When my fair visitor called she brought with her a bottle of wine, a flask of whisky, and a very heavy, oblong cake. My lady asked the sergeant of the guard if he would accept a little token of her esteem. With the nonchalance of an alderman, he reached for the bottle of whisky and offered his profound thanks. He was rather friendly to me, and, knowing my impending fate, tried to make me comfortable. I was afraid I had aroused suspicions when my hands dropped under the weight of the heavy cake, but fortunately his eyes were still focused on the label on the bottle. Within the cake reposed three hack-saw blades, a wood-saw blade, and a steel jemmy. These I secreted in my bedding, and spent the remainder of the day on my back, figuring out my plan of escape. The guard-tent was just outside the door of the steel detention shed, and a sentry patrolled this tiny beat day and night. His short patrols made any attempt at sawing difficult, but I began at once at the tedious effort of cutting the tough uprights. The problem was serious. The least scraping sound echoed through the metal building like a sneeze in a cathedral. The perfect acoustics of the building hampered my operations. I determined to take another man along, and found a willing confederate in a husky six-footer by the name of Reilly, one of the men from my flying column. Reilly aided in the job of sawing, and was a fine accomplice. A little work was done each night with the aid of an impromptu musicale, which I arranged for the sole purpose of dulling the scraping of the saws. After the post had been cut through, the cracks were stuffed with soap and smeared over with dust. Detection was now impossible, yet a stiff push would slide them out of place. It was now the 2nd of July. Reilly and I decided to make our attempt on die following night. 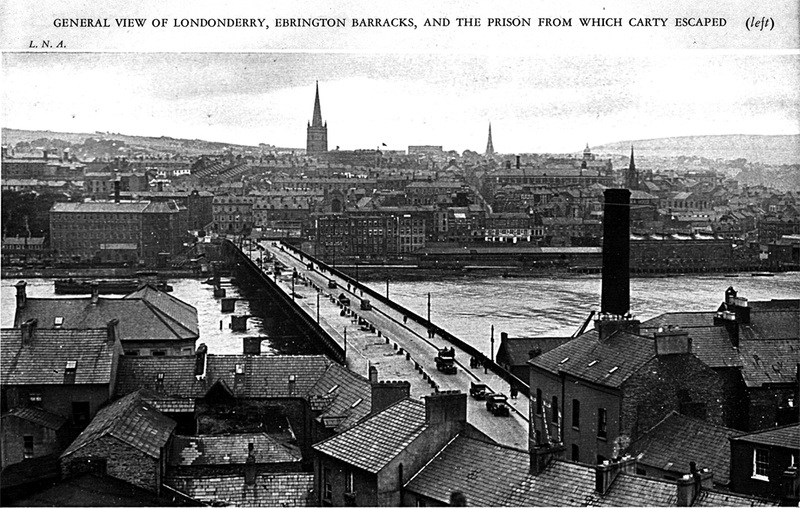 Word was sent to the Republican commandant at Derry to have a group of men outside the barrack wall after midnight to receive us. Boats were to be in readiness for a swift crossing of the Foyle, a tidal stream lined with wharves on one side, and the lights of steamers gleaming pink and yellow along the inky surface of the river. Word came back that men would be waiting for us, ready to shoot any band of Tans or the police who should try to prevent our escape. Shortly after midnight, Reilly waited in nervous tension for the change of guard. Earlier we had primed the midnight sentry with several potent shots of overproof Irish whisky. We could hear his slow jargon to the fellow he was relieving, and took swift advantage of the delay. In the precious minutes while the guards chatted our friends pushed out the severed post, and we scrambled under the sheets of steel in the manner of rabbits burrowing under a fence. Out of the yard we scurried around to the open wash-place, situated in an alcove about a foot deep. My job was to climb the first wall, which was eighteen feet high. I jumped on Reilly’s hefty shoulders, and hooked a noose on the iron bars supporting the barbed-wire entanglement on top of the glass embedded coping of the wall. The rope was plaited from a prison blanket during the day, and was strong enough to bear a man’s weight. Climbing the rope, I seized a projecting bar, but it bent under my weight like a lead pipe, and I was compelled to drop back. Fortunately Reilly checked my fall with his body, and a dull thud was the only sound. We were losing precious seconds, however, and it was time for the sentry’s appearance. Another few moments and we heard his shuffling footsteps. Dashing to the cover of the wash-place alcove, we crouched there, scarcely daring to breathe. A faint shadow passed over us and we heard mutterings. Once more Reilly hoisted me upon his shoulders, and I lassoed another bar, a stronger one which supported me without buckling. I was stocking-footed, and my first blood was drawn on the teeth of the barbed wire. Throwing my leg over the wall, I pressed close—so close to the coping that injury from the wire was inevitable. Below Reilly was again having to take cover while the sentry made another round. At last I lowered the rope to him, and, with great effort, hauled him to the crest of the wall. He was powerful, but not very acrobatic, and as the sentry approached he had to drop back and take fresh cover. The coast clear again, Reilly tried desperately to clear the spikes and barbed wire, only to meet with frustration. Finally he quit in despair. Reilly sneaked back under the metal wall, leaving me to survey the terrain that I must cross. Realizing that the odds were against me, I moved stealthily along the wall top. I was an easy target for the sentries, silhouetted against the purple sky. My first objective was a tall tree that grew alongside the wall. I reached it, and climbing on to an extended branch lowered myself to the top of a garage. My wounded hand and hip were a nuisance in negotiating the stiff jumps en route. Crawling along the top of the garage, I was preparing to climb over the side when I noticed the glow of a cigarette less than a hundred feet away. It was a sentry stealing a smoke. I crawled back to where I saw a skylight slightly ajar and, opening it very slowly, dropped down on the roof of an armored car inside the garage. The garage was easy to open from the inside, as it had a Yale latch on the door. From this vantage I observed the sentry until he doused the cigarette and moved on in his circuit of the parade-grounds. The next wall was rather low and I scaled it with ease. Two more walls intervened, and then a long stretch of open territory to be crossed. The first intervening palisade was high enough, but it had some decorous grille and rough stonework to give me a fair footing. My training as a sailor was invaluable in this experience, but nothing could protect my feet and body from painful lacerations. Adjoining this wall was another long row of stables. On reaching the roof I took a rest from my arduous labor. Just as I was about to seize the drain gutter and descend into the grounds another sentry hove into view, and I retreated from the range of his vision. When I was able I descended into the field. Momentarily I expected to hear a rifle and feel the sting of a bullet. How long it took me to wriggle across the open ground I do not know, but I died a hundred times in that long journey. At last I reached the tall, rank growth along the outer wall. The last obstacle was fourteen feet high. It was a sheer climb with no rough crevices or iron bars to aid the ascent. Once more Fortune was with me, leading me to a long pole lying in the wet grass. It was moist and greasy, but it was long enough to reach the top of the wall. I shinned up, slipping and scratching in feverish energy until I reached the top. I kicked away the prop and dropped down on the hard earth outside. The sting and jar on my bare feet was extremely painful, and I writhed in pain. Then, as I moved along, I heard the guildhall clock chime four. It had taken just four hours to reach the outer wall, and by that time my waiting confederates had long since given up the vigil! Though outside the prison, I was a long way from safety. Derry was under curfew, and all night long the military patrolled the streets in platoons and armored cars. Heading for the banks of the Foyle, I sighted a string of railway wagons along the river bank. These would be my shelter until the curfew lifted. I reached them, after a mad dash in the greying darkness, for dawn comes early in the Irish summers. Under a car I waited until the clock struck 6:30, fearful lest the wagons should be shunted and leave me exposed between the railway tracks. Once the bustle of the day began I ventured down to the river bank and plunged into the water. There were several small boats moored a hundred yards beyond the range of thieves and prowlers. I seized one and rowed across the Foyle to a wharf where several steamers were moored. Landing, I dashed up a small lane towards the main street of Derry, aiming to seek a haven in an hotel owned by a relative of mine. Then I heard the echoes of heavy hoof-beats. The R. I. C.! I turned quickly and hurried back to the wharf and jumped aboard a steamer that traded across the Irish Sea. A desperate spectacle I must have made with my bare, bleeding feet and half-naked body. I approached a man, still couched comfortably in his cabin, and asked for a drink of water. I was prepared to use force to forage enough clothing to get out of Derry, but once more fortune was on my side—with a vengeance! The man I disturbed was my uncle, whom I had not seen since early boyhood. Irish blood is much thicker than water. No questions were asked. He got a makeshift rig for me and some water. I washed my face, and was almost presentable when I went ashore. I sought a hiding-place in the heart of the Unionist district, thinking that the foe would search for me in the Catholic quarters of Derry. A friend whom I trusted lived here. I was about to knock, but the blinds snapped. A moment later, the door opened and I slipped in without any useless exchange of greetings. A steaming breakfast was prepared and, just as I was lifting a cup of tea, the guns boomed out and the bells rang. A second prisoner had escaped. But it was not Reilly. True, Reilly attempted another escape, together with some other men, but it was badly blundered. Two warders were killed and Reilly and his fellows were removed to the grim prison at Peterhead in Scotland, where the dungeons are hewn out of solid rock and run far under the sea. From the damp cells, they contracted tuberculosis, and only one of them is now alive.